This recipe was featured in an Eating Well Magazine piece about how to layer on the umami flavors in vegetarian cooking. Which is never a bad idea. Did you know that corn is considered a source of umami flavor? I didn’t, but I can attest that the sweet kernels were welcome in this dish. Miso, soy sauce, tofu, and eggs also play into the deep flavor, and you might even consider adding some thinly-sliced shiitake mushrooms if you come across them. I’ll be adding this meal to our dinner rotation as we lighten up our cooking for spring. It’s full of flavor, quick to make, and can easily be adapted to accommodate the contents of your fridge. It’s also kid-friendly, which is no small consideration around here. In fact, this “Tofu and Vegetable Stew,” as it was stodgily named in my magazine, is really just a beefed-up (well, tofu’d-up) miso soup with a nice kick of ginger. We made a meal of it by serving it over rice. 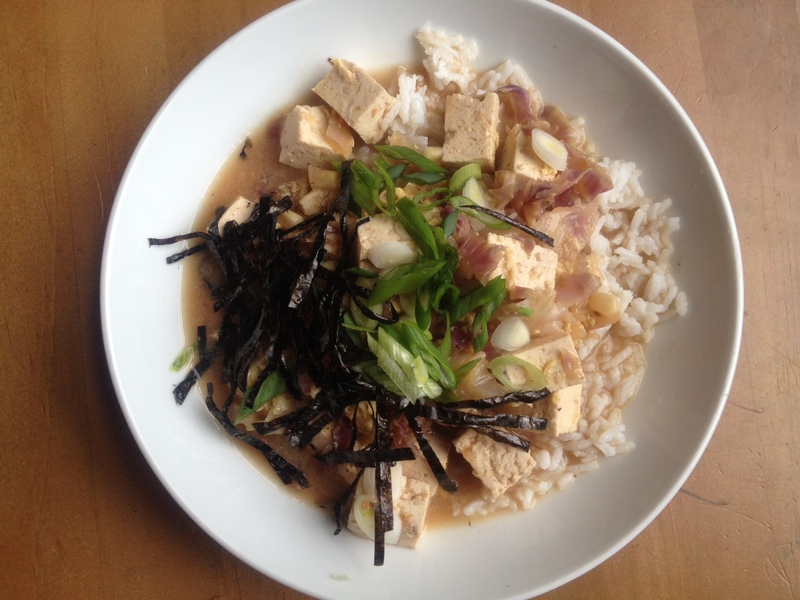 Hearty Miso Soup with Ginger, Corn, and Tofu: Saute a diced onion with 1 1/2 Tbsp. grated ginger over medium-high heat, stirring frequently, until onion begins to soften. Add 4 c. shredded cabbage and cook for a minute or two until it begins to wilt, then add 4 c. vegetable stock and 1/2 c. snipped dulse or arame seaweed (I didn’t have either of these, so I just added shredded nori on top of the soup when I served it). Bring to a boil, reduce heat and simmer 5 minutes, then add 1 c. fresh or frozen corn and simmer 2 minutes. Add 1-2 blocks tofu cut into 1/2″ pieces (the recipe calls for 2 12-14 oz packages; next time I might use 1 1/2) and simmer 3 minutes, until hot. Stir in 1/4 c. miso and simmer one more minute. Drizzle two beaten eggs all over the soup and let them simmer, undisturbed, for 1-2 minutes, until the eggs have just set. Remove from heat and gently stir in 2 Tbsp. rice vinegar. Serve over rice, topped with sliced green onions (and nori, if you didn’t add seaweed earlier). This entry was posted in Asian Flavors, Eggs, Feeding Kids, Tofu, Vegan or Would-Be-Just-As-Good-Vegan and tagged cooking, dinner, DIY, eggs, family, food, homemade, kids, lifestyle, recipes, soup, tofu, vegan, vegetarian on May 6, 2012 by emmycooks. Do it! I ate the leftovers for lunch and they were just as good. I personally would skip the cornstarch, though, since I like miso soup light and brothy. The egg in this recipe doesn’t thicken it, since it’s not whisked in (you just let it set on top), so for a vegan version I would just leave it out entirely. Enjoy! Ah, good to know! Don’t know how you create new recipes every day with little ones under foot. I get so frazzled that I’m lucky to get dinner on the table some nights, and usually then it’s an old standby ;) You amaze me! I love making miso soup! This recipe is quite different from mine, I will have to give this a try! I had never made a soup quite like this either, but it was so easy and delicious that it will be a keeper! Very excited about this one, especially as we have a tub of miso because Mark Bittman insisted that adding miso to everything will change our lives for the better. Oh, Mr. Bittman. He’s kind of preachy, isn’t he? The one way in which miso has truly improved my life is this: http://www.epicurious.com/recipes/food/views/Japanese-Turnips-with-Miso-354957 (short version: smash 3 Tb. miso with 2 Tb. butter, slather on veggies/tofu/rice/everything). But if you have a tub of miso around, this soup is also a nice way to put it to work. Looks so good and so healthy! Yum! I never knew that corn was a source of umami. That makes me look forward to summer corn! Summer corn that will probably start arriving mid-Spring because the weather has been so crazy! Nothing is as comforting as a simple meal like this. I adore miso, and anything with corn! Looks so soothing and satisfying! Eating and enjoying right now. 14-year-old vegetarian says 7/10 (which is high praise). Younger son enjoyed his scrambled egg and toast.